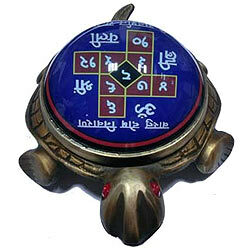 This yantra is a combination of Shree Yantra and Tortoise. Shree yantra is considered a yantra of wealth , prosperity and success. Tortoise is one of the four celestial animals (Dragons, Phoenix, Tiger and Tortoise) in fengshui practice. It is considered the greatest sign of longevity, stability, steadiness, fortune, support and protection.